← Rebecca Holden Attending KnightCon Star Cars & Heroes! As subscribers to our Facebook page will know, I recently visited a London landmark that is very popular with Knight Rider fans, and has always been on my list of places to visit. 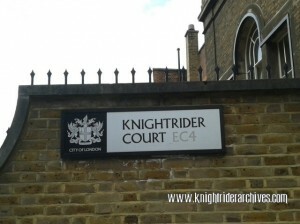 Yes, London, England has its very own Knightrider Street, and it’s located in the very heart of the city, just a short walk from St. Paul’s Cathedral. 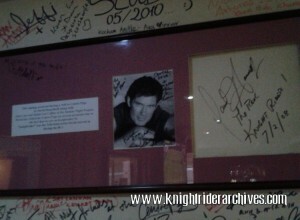 While he was appearing on stage here in the musical Chicago, David Hasselhoff stayed nearby and was a frequent visitor. Of course, the street’s name doesn’t come from a tribute for the television series, or out of some kind of Hasselhoff hero-worship. It’s named for the processions of medieval Knights that came from the nearby Tower of London on their way to Smithfield where jousting tournaments were held. Fans of the series from around the world love to visit and pose with that street sign. 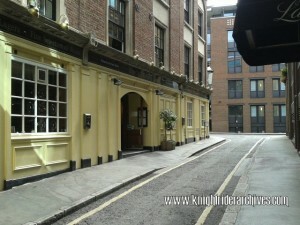 At the end of the road sits the Centre Page, a traditional London pub with a rich history dating back to the 1600s. It was partially destroyed by the Great Fire of London, and also survived the Blitz of World War II. Samuel Pepys mentioned the pub in his historic diary, and Charles Dickens namechecks it in The Pickwick Papers; it is also said that Guy Fawkes held meetings here about his Gunpowder Plot. The Centre Page serves food and drink in a friendly atmosphere, and it features a display of framed autographs of David from his many visits here. 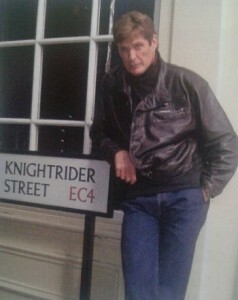 Fans will get a kick out of his personalised message, which reads: “The Real Knight Rider!” Their website also has a small gallery of photos from some of his visits. 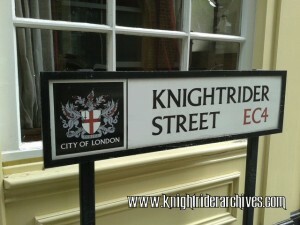 Any Knight Rider fans visiting London from around the world should be sure to pay Knightrider Street a visit! 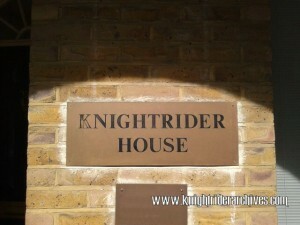 This entry was posted in Places, Site News and tagged David Hasselhoff, Knightrider Court, Knightrider House, Knightrider Street. Bookmark the permalink.